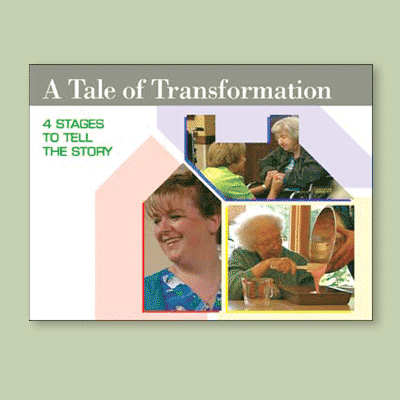 This workbook and DVD, A Tale of Transformation: Four Stages Tell the Story, focuses on the work by Leslie A. Grant, PhD of University of Minnesota and LaVrene Norton, MSW of Action Pact, Inc. It is filled with images, learning circles, and stories of culture change that will guide you whether you’re at the earliest stage (institutional) or have already transformed your facility and energized your staff in the transformational and neighborhood stages, or completely renovated into the Household Model. The workbook includes exercises, team activities specific to each stage. LaVrene, an early pioneer in culture change in long term care, has a strong reputation in organizational dynamics and a deep understanding of how nursing homes function, the problems that they face, and the opportunities they have for change. She shares this knowledge extensively in both the DVD and the workbook. The work was funded by the Commonwealth Fund, and commissioned by AHQF to support the work of QIOs around the country who have the special challenge of working with facilities at various stages of culture change. The DVD was scripted, filmed and edited by Action Pact, Inc. All proceeds go to the Pioneer Network to support their on-going efforts in furthering culture change in long-term care.